That’s what I want for Christmas! 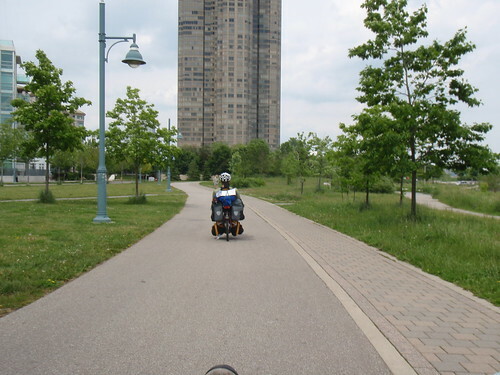 Today was a relaxing ride through a variety of suburbs of Toronto and along the waterfront trail through downtown. When riding through the suburbs it was interesting to see the dramatic differences between the original homes (usually small bungalows) and the in-fill (huge 2 or 3 storey multi-car garage monster homes) all packed together on the same streets. Over the last few days, I’ve be struck by how much of the Canadian Lake Ontario waterfront is publicly accessable parkland. The US side only had a few parks, and much of the shoreline was private property. 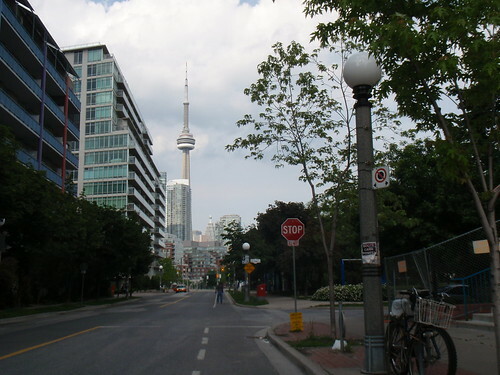 In Canada, most of the waterfront property is set back from the water, with a buffer that is public parkland. I have also been struck by how friendly the people we came across were in the US, and how much less friendly people seem to be here in Canada. When we ride, we say Good Morning or Hello to anyone and everyone that is looking at us. In the US, I don’t recall anyone who did not reply with a smile and a greeting in return. In Canada, we see many people who ignore our greeting and do not even return the slightest indication of a smile. As a Canadian, I find that very sad. 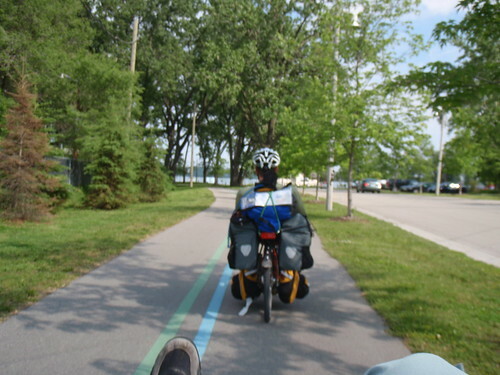 Here are some random photos from the Waterfront trail as we rode from Oakville to Scarborough. No, I’m not trailing toilet paper from my left front pannier. That’s white duct tape from an (unsuccessful) temporary repair. Unfortunately, with the RT-40s hanging so low on the front, I’ve scraped them across the pavement a few times and worn a couple of small holes through the Cordura. Several people have pointed out that RT-40s were never intended for this position, and I’ll try swapping them with my rear Ortlieb BikePackerPlus bags, which are both narrower and don’t hang as low. This entry was posted on Saturday, June 14th, 2008 at 4:58 pm	and is filed under Journal. You can follow any responses to this entry through the RSS 2.0 feed. You can leave a response, or trackback from your own site. That first shot in particular leaves me longing for the open road. Maybe you should take some shots of you sitting out a thunderstorm or grunting and sweating up a long hill for a more balanced view! Your comments about Canadian vs. American hospitality corroborate what my dad has been saying for years. So much for our self-proclaimed friendliness! Very sad, indeed. Becky’s panniers don’t appear to trail as close to the ground. Are they the same kind as Scott’s rear panniers? They look similar. How do you take pictures while riding? Do you just ride one-handed, or do you have some other clever scheme? 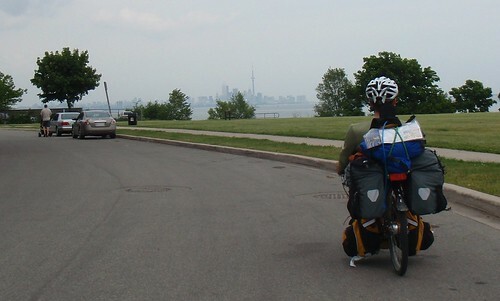 Any concerns about theft when/if you leave your bikes unattended or camp in a public area? 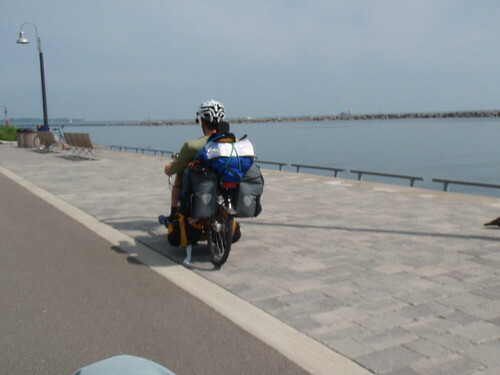 Yes, my panniers are not as close to the ground because they are much smaller – too small in fact. We are struggling with finding the ideal pannier solution, as the front ones cannot hang too low. I wear my camera around my neck and snap random shots while we ride. Some of the photos are rather entertaining and require a little bit of “editing” in order to make them presentable .. however, it means I don’t need to slow down to take pictures so more get taken. Most of the better photos are taken by Scott, as he actually stops when he sees a good picture! For unattended bikes, we haven’t been concerned yet. When we go into a cafe for lunch, we always sit where we can see them. When they are loaded we often don’t bother to lock them, as no one could go anywhere with them quickly, and we’re watching (it is actually really amusing to see peoples reactions to them when they walk by). Given that it takes a fair bit of practice to learn to ride them, we aren’t concerned with anyone just hopping on and going. In campgrounds, we lock them and cover them with a tarp, so they are not obvious. So far, so good.